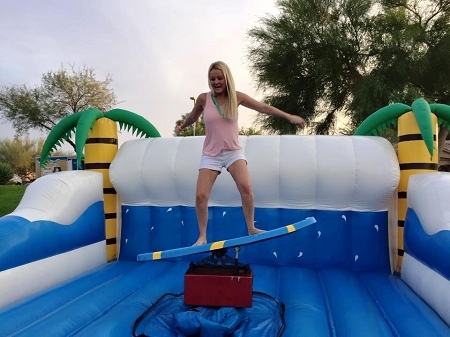 Mechanical Surfboard Simulators are the perfect addition to any party or event rental inventory and will be popular with beach themed events. Our Surfboard Simulator ride has a ton of features and is very fast and easy to transport, setup and operate. We sell the Surfboard Simulators as a complete package or just the themed Inflatable and the Surfboard Attachment. We will have updated photos of this Mechanical Surfboard posted soon with a custom inflatable mattress never seen before. It will be available for delivery in March 2017 so order now for the spring event season.